Years ago, Michelin had one of the greatest taglines in advertising history: Because so much is riding on your tires. The line, with its obvious play on words, sent a clear message to parents. It said buying chintzy tires isn’t only cheap, it’s potentially dangerous. When the rain is falling and the bridge is icy, do you really want second-rate tires on your station wagon? No. You don’t. Because the family is too precious, your child’s safety too invaluable. 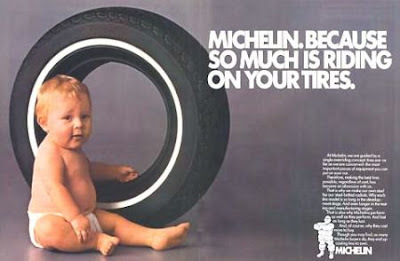 The line, coupled with that adorable Michelin baby, worked like gangbusters because it gave meaning to Michelin tires. It not only validated the higher price tag, it also validated parents. It said, Hey, I’m a good parent. I buy Michelin tires, therefore I care about my kids. I’m doing a good job at this raising a family thing. In the book The Hero and the Outlaw: Building Extraordinary Brands Through the Power of Archetypes, the authors argue that the “meaning of a brand is its most precious and irreplaceable asset.” And I agree. What a brand means to consumers is much more valuable than the sum of its many product attributes. People don’t want to know the chemical compound of rubber that gives those tires that icy-road grip. They want to know they’re good parents, that they’re making the best decision for their family. It’s not a new concept of course. It’s the essence of branding. But Michelin’s most recent campaign is a perfect example of a brand searching for new meaning. Since the Michelin baby (which people in focus groups still vividly remember) Michelin has kind of floundered in their advertising. In the ad below, Michelin strives to be the technologically advanced, environmentally friendly, all-things-to-all-people brand. Especially on the eve of an economic downturn, when premium priced items are the last things on anyone’s mind. It was a shotgun approach to giving the brand new meaning. There’s throw a bunch on things on the wall and hope something sticks. But the new campaign by TBWA Chiat Day gives Michelin new meaning that feels like a step in the right direction. 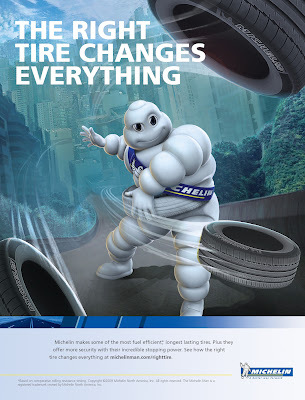 The weakest aspect of the campaign is its line “The Right Tire Changes Everything.” Which feels a little . . . meh. The statement may be true, but it comes off flat when you hold it up to the line of yesteryear. Of course in its defense, it’s attempting something entirely different — a practical instead of an emotional strategy. Right now, considering that most Americans are crying over their 401K, it’s probably safe to assume that people are less concerned about safe driving in a rain storm than they are about making the right economic decision. And that doesn’t necessarily mean taking the cheapest option. These are the days of the smart shopper, the one who can see the big picture. And that’s the campaign’s goal. Michelin tires are more expensive yes, but think long term, people. You’re going to save a boatload on gas with these babies. But even if it wasn’t, I’d still love the first spot in the campaign, in which the Michelin Man quite literally adopts the mythological hero archetype and takes down a money-guzzling gas tank monster. The animation is fantastic. The voice over is great. And turning the Michelin Man into a tire-chucking superhero is two thumbs way up. Why hasn’t anyone thought of this before? I mean, the guy is made of tires, for crying out loud. Let’s use that, shall we. So what used to be the Protector brand has now become the Hero, the answer to all your car-related needs. It’s a bold statement for a tire company to make. Can a tire change that knocking sound in my transmission? Don’t think so. But I’m going to give Michelin the benefit of the doubt. For now. They’ve got me nodding along with the fuel-efficiency spot. But only time will tell is the right tire truly changes everything.